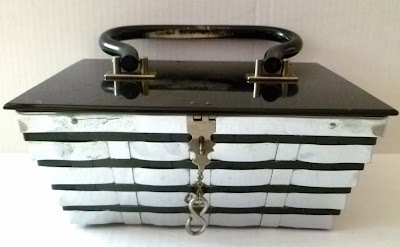 Woven Metal Box Bag with Lucite Top. 1950s. No maker tag or imprint. 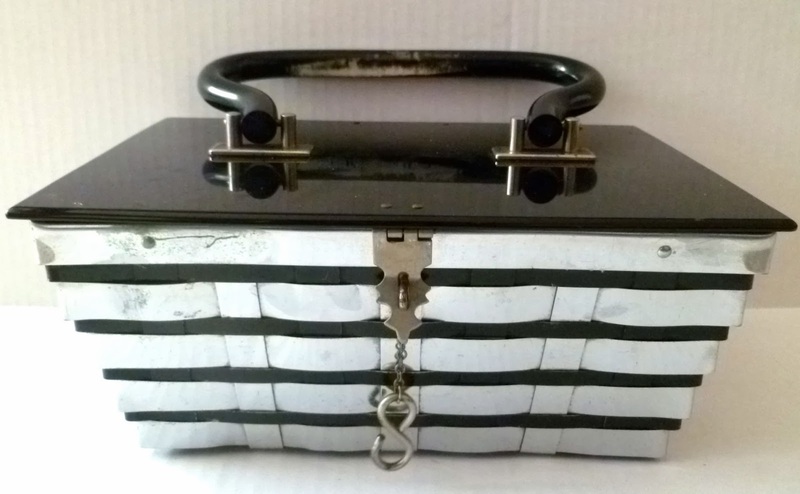 Woven silvertone metal box purse with black-painted metal straps in between the silver straps. Black Lucite top. Black-painted early plastic handle. Silvertone hardware and four silvertone feet. Very interesting clasp with S-lock chain closure for extra security. Lined in grosgrain. Patent number on the bottom. Well worn, but still a lovely bag. I’m pretty sure it’s a Dorset-Rex, but I can’t find a mark. Any suggestions or comments, please email info(at)vintagepursegallery(dot)com.